You may be surprised to hear this but one of my favorite actors of all time is 1930s character actor, William Powell. He’s not the conventional leading man for the time like Gable or Grant was. However he was so damn charming. Whether it was “My Man Godfrey” or “Catch-22” Powell commanded the screen. That’s why it felt only right that the podcast of Kurland On Film begin the “Back In Black & White” series with my favorite martini drinking, social climbing sleuths. I of course am talking about the 1934 classic, “The Thin Man” starring William Powell and Myrna Loy as Nick & Nora Charles. It’s a travesty how this film has fallen so far off the radar after being one of the greatest detective films of the 30’s. If you’re unfamiliar with the film or Dashiell Hammett’s novel of the same name let me give you the cliffs notes. Nick Charles is a retired Detective. He is married to a rich socialite named Nora Charles. They end up having to solve a triple homicide all while looking dapper and drinking to excess. The reason these films were as successful as they were are due to the talents of Powell and Loy. The chemistry that radiated off the two of them was electrifying. The witty repartee between the two feel between admiration and playful domestic squabbling. To watch Powell and Loy back then you’d have thought they were married for decades. He clearly loves and respects her, and vice versa. The reason for this chemistry is part the actors but in this critic’s most humble opinion it would have to do with the screenplay from husband and wife duo Albert Hackett and Frances Goodrich. You only get this type of writing from a couple who are happily married and willing to bicker. We really should be calling this series back in Black & White. It should truly be called Back In Black & Silver. The film processing system isn’t a white tinge it’s technically a translucent silver that popped when it hit the silver screen. There’s your one bit of useless knowledge for the day…. thank me later. This film is so beautifully shot and gorgeous to look at. How W.S. Van Dyke and Cinematographer James Wong Howe captured the glamour and sorrow of 1930s drinking parties is beyond me. Yet what sticks out the most is Van Dyke’s pacing and establishment of tension. You would have thought someone like Kubrick or Hitchcock would have directed this movie, but they didn’t “Tarzan The Ape Man” Director W.S. Van Dyke tackled literatures most sensational crime solvers. The reason we picked “The Thin Man” is simple, we like it. It’s a perfect film. Myrna Loy is a vision of beauty. You can keep your Rita Hayworths and Marilyn Monroes, Myrna Loy is the true bombshell of her time. As for charm and charisma look no further than William Powell. It takes a truly great actor to make you believe they are one of the world’s best detectives. Nick Charles is one of the greats, up there with Spade, Holmes, and Poirot. That’s why William Powell is as good if not better than Bogart, Rathbone, and Suchet. Powell has to border on fall down drunk and world’s greatest investigator. In the hands of any other actor this role would be to broad and ridiculous. Powell proves why he was the most underrated actor of the 1930s & 40s. I know for a fact that younger generations have not seen “The Thin Man.” That’s why we’re watching these films. Hopefully by talking about them you guys start rekindling your love for old Hollywood. 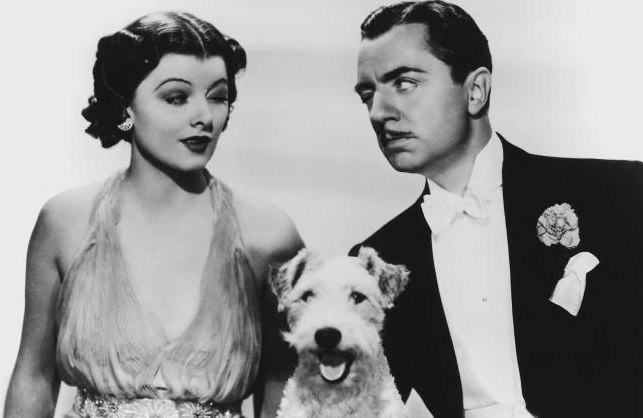 “The Thin Man” is one of the greatest murder mysteries to be captured on film. It tackled taboo topics like divorce, as well as showcasing a romance that screams relationship goals. Nick loves Nora, and Nora loves Nick. They trust each other, and want nothing but that person who can truly get them….a stiff drink.